← Quails’ Gate, Old Vines Foch, Okanagan Valley, British Columbia, 2009, 15% abv. If you’ve ever suffered through any of the 6 courses required for the WSET Diploma of Wine, you’ll recognize this common study tactic. By the third to fourth week left before the exam, you start to cull through all former exam papers you are able to find and you set up a spreadsheet of all question possibilities. Then you proceed to study your brains out and drive all your loved ones batty in anticipation of these being on the final. This wine was purchased because several of us really thought it was Argentina’s turn for a hugely in-depth look at the country’s future global market share possibilities. It sure helps to know what a bottle of the country’s best known white tastes like. There are so many insipid, characterless white wines on the market – Pinot Grigios, Chardonnays and Sauvignon Blancs that have no flavour (or too much) and do little to inspire. Argentina has a nice in though with its reasonably priced dry (for the most part) whites based on the indigenous Torrontés grape. A cross between the local Criolla Chica and Muscat d’Alexandria, Torrontés (this one is actually Torrontés Riojana, the most noble of the three) offers a refreshing change from the same old, same old whites when you’re looking for a salad partner. 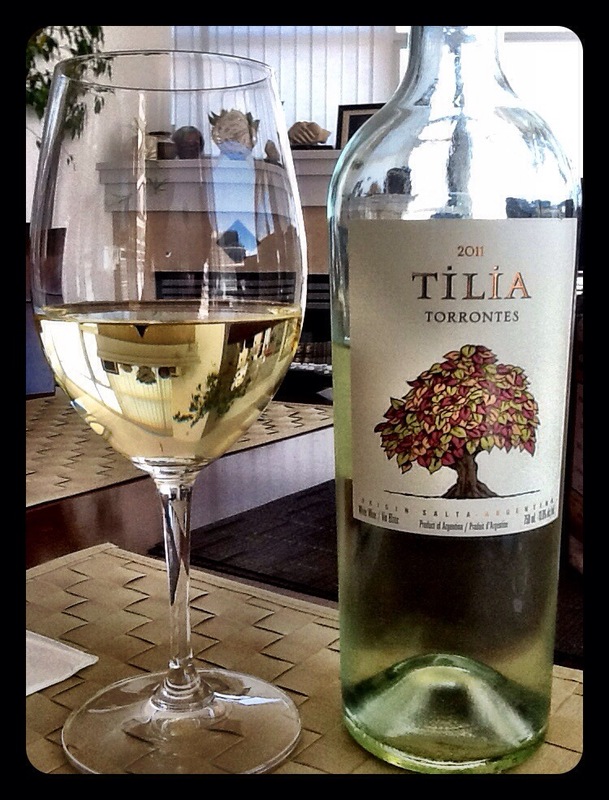 A pretty shade of lemon, the Tilia offers a floral nose with some pink grapefruit and almond. The palate has medium plus acidity, flowers, roses, rose hips, green vine more grapefruit and slight bitterness. It’s refreshing, juicy and tasty. WSET Very Good, drink now (not suitable for ageing). It pairs perfectly with fresh market greens and grilled white fish. Oh, and if you’re wondering, nope, nada, nyet. There were no exam questions at all on Argentina. Don’t say I didn’t warn you, future Unit 3 candidates! This entry was posted in Argentina, Torrontes, WHITE and tagged argentina, Salta, Tilia, Torrontes, white wine. Bookmark the permalink.